Multimedia programs (MP3 player, AVI and QT player, new CD player). Web browser AWEB 3.4 SE (new version). Genesis (full Internet and network access). AmiDOCK (new program start bar). IomegaTools (for Zip and Jaz). New powerful Shell (with extensive prefs). Integrated unpacker (LhA, Lzx, DMS, Zip, and more). Fast search (search for, and within, files). Many new Tools (AslPrefs, new Info requester, new watch, font cache, new color wheel, etc.). Extensive HTML documentation (in English and German). The above information can be found here (Haage & Partner's website). "Do You Know The Way To San José" string inside the libs:workbench.library file and "God Only Knows" string inside the C:IPrefs file written by Olaf Barthel referring to a Beach Boys song. Contributed by Ignacio. The Hungarian text string "Szeress engem - Csak annyira, hogy - Érezzem, hogy - Nem vagyok egyedül" - Rony in ACTION 45.3 (by Laszlo Torok, author of the MooViD/ACTION video player) is a reference to a pop song from the Hungarian singer Rony. Contributed by Ignacio. The text string "Thanks to Nessy for some very useful code!" is written in the AmigaOS ROM Update 45.057 by Angela Schmidt. Contributed by Ignacio. 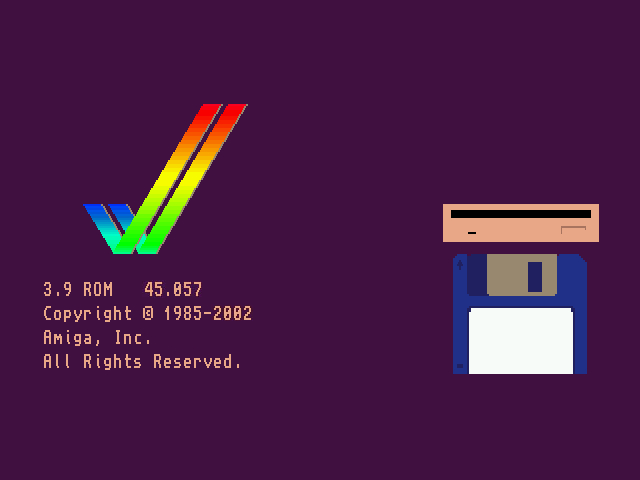 In addition, a purple dragon mouse pointer replaces the normal OS pointer in the Amiga Early Startup Control Screen (boot menu) when the AmigaOS system date is set to March 30th; no specific year is required. (click thumbnail for larger image). Mark Knibbs notes that this may have been the work of Angela Schmidt, whose nickname is/was Nessie. Apparently the dragon image was used as a mouse pointer in one of her programs. Ensure that your Workbench screen size is equal to, or larger than, 800x600 and that the screen titlebar is enabled. AmiDock should now have launched. Activate the Shell window and place the mouse pointer over the workbench title bar. The Official OS 3.9 FAQ is now online with information about mailing lists, known bugs/solutions, and more. A third-party HTML review of OS 3.9 is also available. The first 75 copies of OS 3.9 released were signed by Petro Tyschtschenko. A printed manual for OS 3.9 called "Das Buch" (meaning "The Book") will be on sale the same day 3.9 is released (currently only in German). Considering its time constraints, OS 3.9 will have had the shortest beta-test period of all AmigaOS releases. 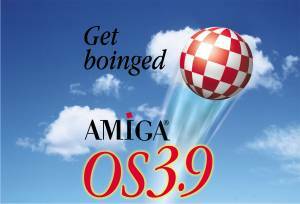 Bill McEwen has obviously provided the financing for AmigaOS 3.9 as the sales for AmigaOS 3.5 were not enough on their own to allow this next step up. Thanks Bill!